Spacecraft missions during the last years have documented many planets outside our solar system (exoplanets). In particular, the increasing number of discovered candidate exoplanets with sizes in between Earth and the solar ice giant planets is stunning and requires extra attention since they are lacking an analogue in the solar system. The internal composition of these so-called mini-Neptune or super-Earth planets is mostly unconstrained. 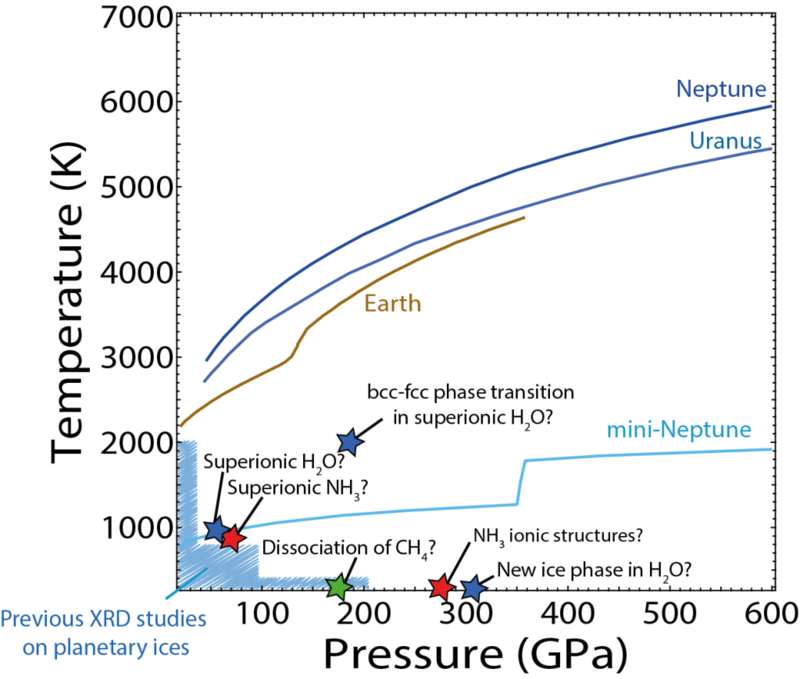 Vital to our understanding of the internal structure and evolution of these exoplanets, and indeed to our understanding of the solar ice giant planets, is an accurate knowledge of the phase diagrams and equations of state of planetary ices, in particular water H2O, ammonia NH3, and methane CH4 (and mixtures). The P/T space that has been covered by previous experiments that involve x-ray diagnostics (to determine state and crystallographic structure) is extremely limited. Our DFG-funded project “Experimental study of planetary ices at high pressure using dynamically-driven DACs” is part of a coordinated research program within the Research Unit “Matter Under Planetary Interior Conditions”. This Research Unit is led by Ronald Redmer (statistical physics, University of Rostock) and involves partners at BGI, DESY, European XFEL and DLR. Within this project, which is a collaboration with Hanns-Peter Liermann from DESY, we will employ dynamically-driven DACs (piezo-, membrane-driven) to compress planetary ice compounds on short time-scales (<< 1 second) and perform time-resolved XRD measurements at synchrotron sources and later on at Synchrotron sources as well as the European XFEL. Collaboration with a computational project within the Research Unit will allow for extrapolating the experimental findings to larger P/T space. The combined experimental and computational data will then be employed by other projects in the Research Unit to quantify the impact of the results on large scale planetary models. The associated Pressemitteilung can be found here. Approximate P/T-conditions that have been reached by previous XRD experiments to characterize the crystallographic structure and compression behavior of planetary ices using static DACs are shown by the shaded region. Several outstanding scientific questions are just outside the accessible conditions and are addressed by dynamic compression experiments in our project.